The popularity of mobile games is pretty much undeniable, but no one knew they are also at the forefront of an intelligence war between Russia and the USA. Okay, that might be a slight exaggeration, but screenshots from a specific mobile game, AC-130 Gunship Simulator, were actually used in the constant war between US and Russian intelligence agencies. Specifically, on the morning of November 14th, the Russian Ministry of Defense published multiple posts in Russian, Arabic, and English on its social media accounts that purported to show “irrefutable evidence" of US and ISIS collusion. The photos included showed aerial photos of military convoys, and the caption explained that the photos showed US units covering ISIS combat units to recover their combat capabilities, redeploy, and use them to promote American interests in the Middle East. While a quick look by the average citizen at the grainy footage might convince some that Russian intelligence has strong evidence of US-ISIS collusion, a closer look by mobile gamers reveals something completely different. Specifically, the “evidence" is actually cropped screenshots from an early promo of AC-130 Gunship Simulator. 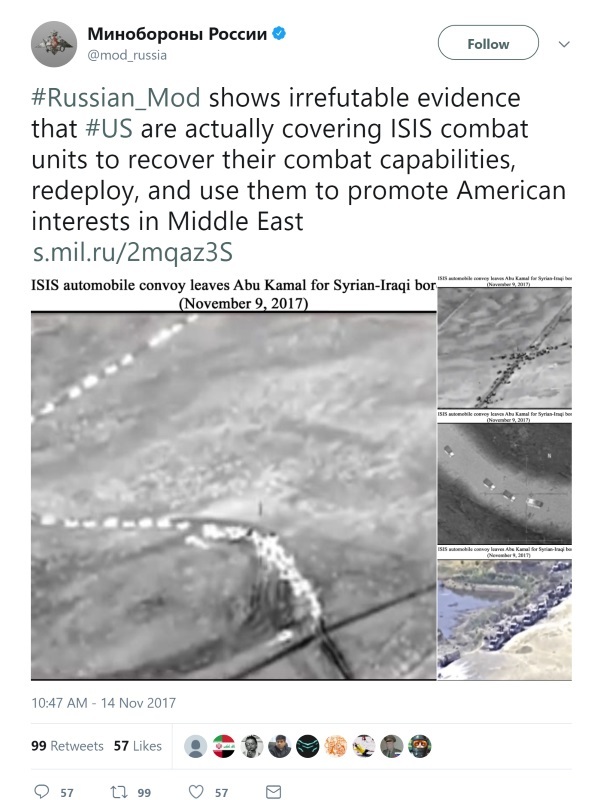 Once people on social media noticed the origin of this “irrefutable evidence" of US-ISIS collusion, the Russian Ministry of Defense took down the posts. And while we may all laugh at this “blunder," I do wonder how many who saw those early tweets never got to hear the debunking. Curious when we’ll get to see other intelligence sources using game screenshots to prove a point. Any guesses what we’ll get next? In the meantime, if you want to get in on the intelligence gathering action, check out AC-130 , one of the many games that use that visual style and gameplay.